SAN FRANCISCO (Reuters) – Target Corp will soon start selling a new electronic reader that competes with Amazon.com Inc’s Kindle and Barnes & Noble’s Nook. The iriver Story HD is the first e-reader to be fully integrated with Google Inc’s eBooks platform, Target said in a statement on Monday. It will cost $139.99 and goes on sale July 17, the company added. During the first quarter, Barnes & Noble’s Color Nook helped the company take the lead in the e-reader market for the first time, according to technology data company IDC. “Amazon’s Kindle was second, but the lack of a color offering has clearly impacted the company’s previous dominance in the eReader market,” IDC said in a report last week. 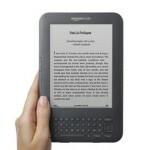 IDC forecasts 16.2 million e-readers will be shipped this year worldwide, a 24 percent increase over 2010.